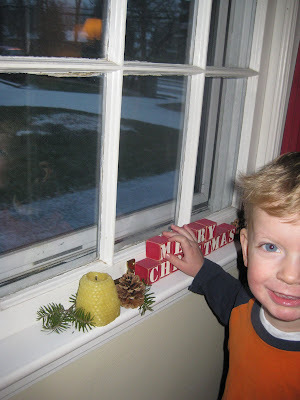 As if the snow wasn't enough, R and G are in full blown Christmas mode. We celebrated Christmas early with Grandma and Papa this weekend and if I had to break it down it was a Thomas the Train Christmas for G and a Star Wars/Legos Christmas for R.
Translation: "Dear Santa. I want a Lego Space Police Kit. From R" We'll work on niceties and politeness next year. 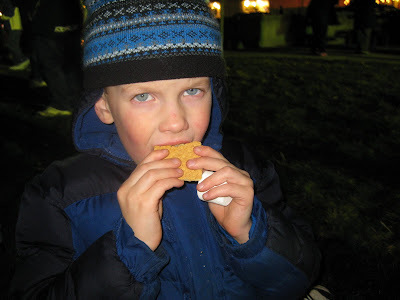 As I mentioned in my last post we went to our town's tree lighting ceremony Friday night. Can you guess what R and G's favorite part was of the night? Our local fire department had about 4-5 fire pits for s'mores making, and the boys were all over making their own. I am still removing marshmallow from G's jacket, mittens and hat. Looks like fun!! Evan is still into Thomas trains, not so much Legos yet but I'm sure it's coming. Wow! You were ready enough for Christmas to start over the weekend!? I bow to your greatness. 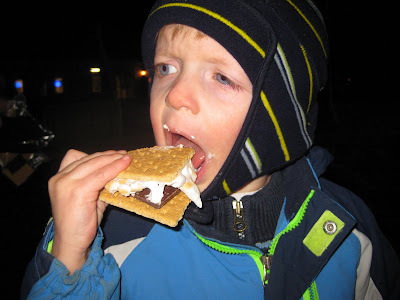 And now I'm totally craving s'mores. 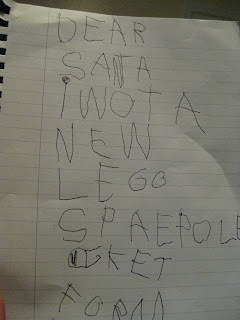 Jake and R have the same Santa Letter. Thankfully we talked him down from the $100 Galactic Enforcer. Phsew. Hopefully your big big snow storm is on it's way. We got about 10 inches today.